The gravity bong is pure stoner genius. Of all the different ways to smoke weed, the gravity bong is one of the most novel methods ever invented. Is it the best way to smoke weed? Probably not, but talk about stoner ingenuity, right. The gravity bong is famous for two things—getting dudes hella high using ordinary household objects and doing so with minimal amounts of bud. Want to learn how to make a gravity bong? Want to know how to make a gravity bong? Great. All you need is some weed, boredom, a 2 liter bottle and another bottle or container that’s larger—your kitchen sink or bucket will do. 1. Cut the bottom off a two-litter bottle. The bigger the bottle the bigger the capacity it’ll have to contain smoke, so look for a 2 or 3-liter bottle. 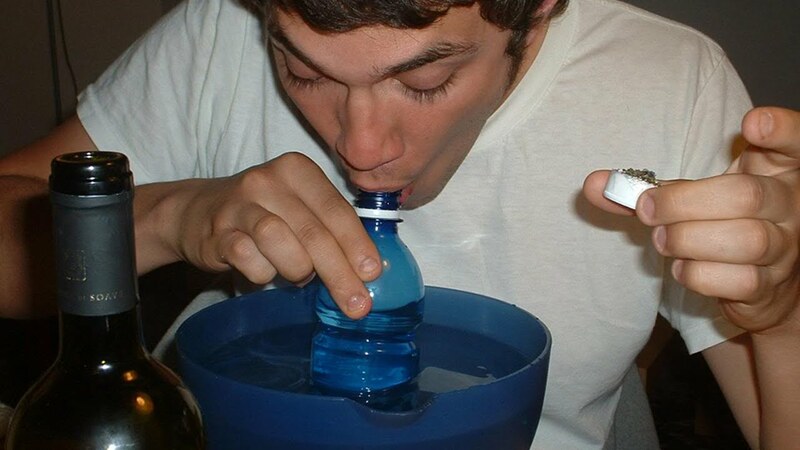 If you want to learn how to make a gravity bong out of a Gatorade bottle or whatever, these instructions also work. 2. Punch a hole in the lid. Use a 3/8 bit and drill a hole right in the middle of the lid. Or use a lighter to heat the plastic lid until if softens, then push a metal or glass tube through it—forming an airtight seal. 3. Make the bowl. The easiest way to do this is to use a bowl from another pipe or bong. You could also use aluminum foil or an aluminum can, but there will probably be some unhealthy off-gassing. Tear of a small square of aluminum foil and lay it flat across the top of the bottle cap. Push it down in the middle with your finger so that it forms an indentation in the hole that you just made. Scrunch the aluminum foil around the edges of the bottle cap like it’s pie dough so that it stays on tightly. Use a pin or needle to poke small holes in the area of the foil that goes into the hole. Make them small enough so your weed won’t fall through. Carefully cut a rectangle from an aluminum can. Bend this rectangle into a funnel shape. You want the top of the funnel to be large enough to put your weed in without it falling through the bottom. Slide the funnel into the hole you made in the bottle cap. The bottle cap should more or less bisect the funnel, so that the top of the bowl sticks out but the bottom will go down into the bottle when you replace the cap. Use hot glue or superglue to glue the funnel to the bottle cap and make sure that the hole has an airtight seal. 4. Get a bucket. You will want one large enough to fully submerge the container. Full gallon jugs work well. Fill it with water. Place the container into the water with the cap removed. The top of the container should rest an inch or two above the surface of the water. Screw on your lid and then pack the bowl—Be sure to put the container into the water first, before screwing on your lid, or it’ll blow your herb right out of the bowl. 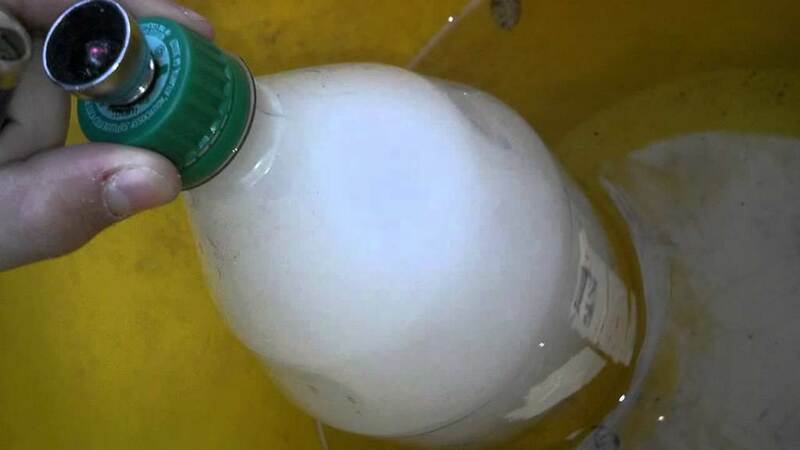 And that’s how to make a gravity bong—you’re welcome. Wanna learn how to use a gravity bong? Well since you took the trouble of making one, it’s the least we can do. 1. Light the marijuana. As you are lighting, slowly draw the bottle out of the water. The bottle will fill with smoke. Once the container is nearly full and before the bottom comes out of the water, prepare yourself by exhaling. 2. Take a hit. Twist off the cap and place your mouth on top of the container and, without inhaling, push the bottle down til it reaches the bottom of the bucket. This will force the smoke into your mouth without you even inhaling. When the bottle reaches the bottom, inhale the rest and take your mouth off just before the water rises close to your mouth. PRO TIP: If you inhale while pushing the bottle down, you might not be able to clear the whole thing. And that’s how to use a gravity bong, dude. Dude! I totally love this. But check this out. Making a gravity bong just got easier! I found this on Amazon. Perfect for making a gravity bong or waterfall bong instantly! Just use a metal socket for the bowl pack man way healthier than aluminum foil. Just melt the plastic cap and put it in there then screw the cap on it makes it completely sealed and it’s way healthier.